One of the awesome things about being a college student is that your connections and interests are super important to companies! It’s so easy to become a campus ambassador for a clothing line or relatively new company that is targeting a college age group. I have plenty of friends that rep magazines or even realtors for students just finishing college. That being said, I have jumped on the band wagon. I’m officially a skimm’bassador for theSkimm. This is what they sent me to tell others when I need to explain it quickly. Which is definitely true, while living on a college campus it’s easy to lose yourself in the bubble. There is already plenty going on without reaching out into the outside world. 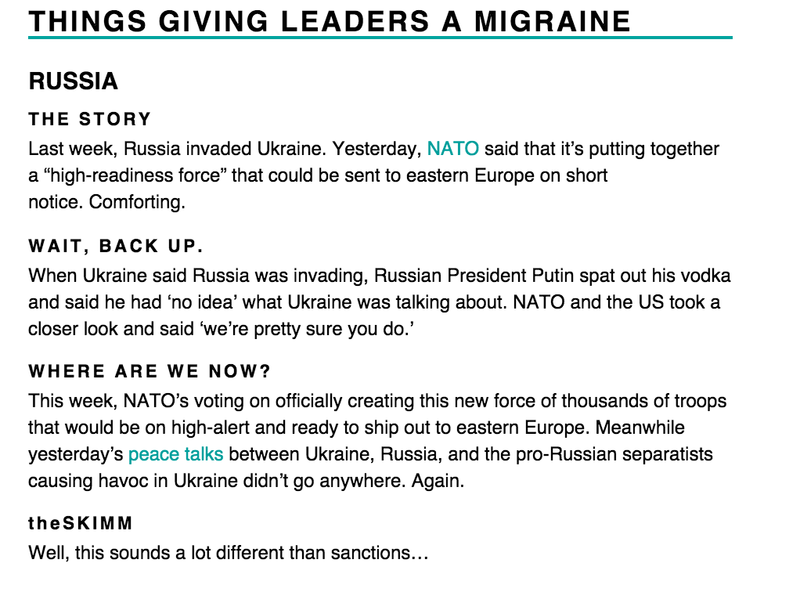 theSkimm only takes a coupe of minutes to read, but is packed with relevant current information about what’s happening in the world with just enough sass to keep it interesting. Here’s a sample of how information is portrayed. And so here is my plug—if this seems interesting to you sign up for the daily email!